Control portion sizes and costs with this Fabri-Kal Greenware GPC200 2 oz. 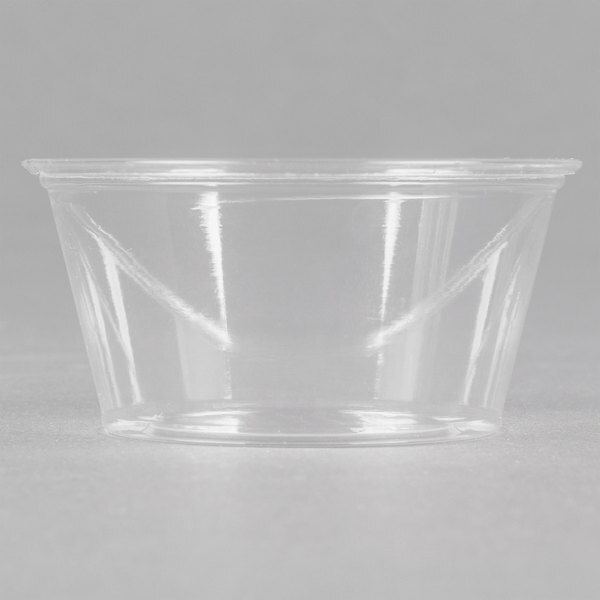 customizable compostable clear plastic souffle / portion cup. Combining a small, convenient 2 oz. size with a crystal-clear construction for superior product visibility, this souffle / portion cup is an ideal addition to buffet lines, tasting sessions, take-out services, and in-house restaurant applications. Plus, it is designed to withstand temperatures from 40 to 105 degrees Fahrenheit, making it great for both cold and warm items. Use it to serve salad dressings, condiments, sauces, or samples! "These are great for salad dressing on the side. Look great and are durable. No bending, breaking, or warping. Love that they are compostable as well." 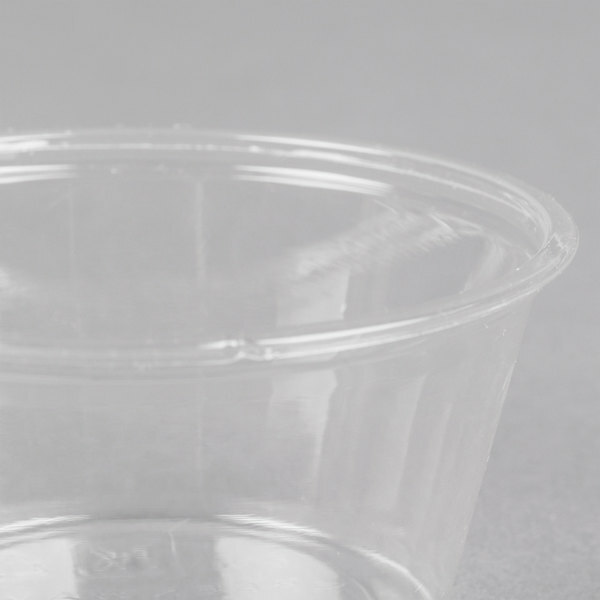 Thanks to its compact form, this cup allows you to serve any condiment or sauce while controlling portion sizes, helping to effectively minimize waste and reduce excess food costs. This "green" cup is made of environmentally-friendly biopolymer, a PLA resin that's derived entirely from plants. It's sure to help you promote an eco-conscious establishment. Its rolled rim provides a leak-resistant seal when used with compatible, snap-fit lids. It ensures the contents won't spill while in transport within to-go bags or boxes. Once guests have finished enjoying your signature menu items, this convenient cup can easily be disposed of for quick and effortless clean up. Can I use Fabri-Kal Greenware items for both hot and cold beverages? Fabri-Kal Greenware items are made from PLA plastic and are suitable for cold use only. Do not store or use them in temperatures exceeding 105 degrees Fahrenheit. Fabri Kal is a nice brand! This soufflé is no exception! We serve condiments with these containers! Does the job nicely! 200 per pack and nicely priced! Love these cups for cold items- they will melt if you use for hot items. Customers love how our items are compostable and can't even tell! Nice to-go containers for homemade dressings and sauces. Stack well which helps with portioning and storing. The clear look is better than frosted, gives a cleaner view of the sauce. First time purchasing this Green-ware brand and I was pleasantly surprised on how sturdy this little cups were. They didn’t give upon any weight.... especially when snapping the lids on. Great product. Perfectly clear and proving to be durable. Great portion size for sampling. The best part is they are sustainably made from non-corn based plants and they are biodegradable! These 2 oz. 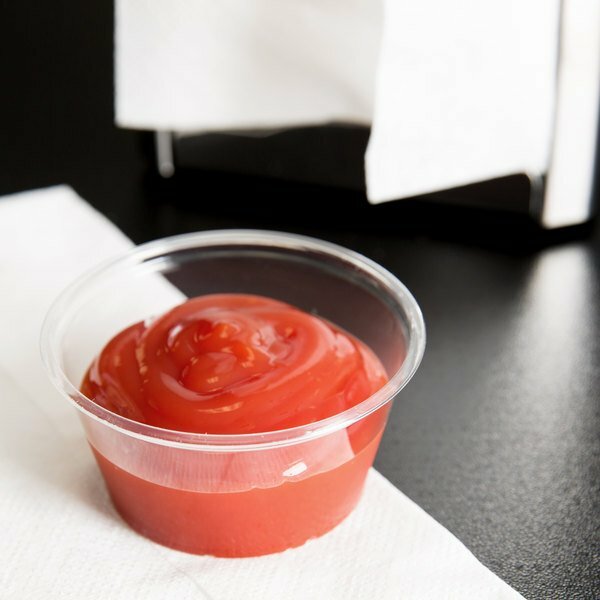 portion cups are the perfect size for condiments such as mayo or ketchup. The price is reasonable compared to buying individual packets of condiments. 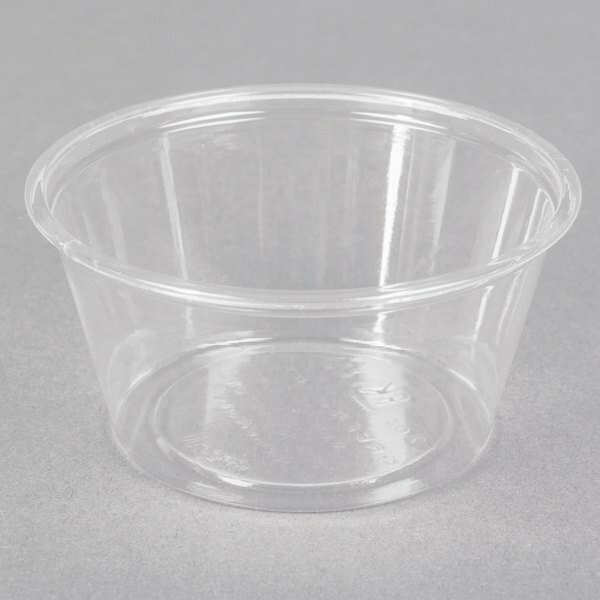 These portion cups are great for food prep. They are high quality and work well with the matching lids we ordered. It's wonderful to be able to have ingredients prepared ahead of time to make the service faster for our customers. 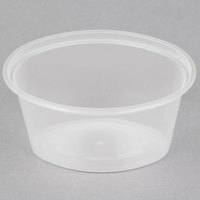 I use these 2oz portion cups for icing for my simple boxes. I like the idea that they are compostable yet they are still very sturdy. The cups & lids are great for sauces condiments. It's a good size & perfect portion. It's pretty sturdy and holds well without the lid coming off. I give these 3 stars because they do not stand any heat whatsoever. Do not put anything thats warm as these will warp and totally melt on you. That aside, these are extremely crisp and clear so if youre just using them for condiments then these are perfect! Stinks that you cant use them for other things. Also the lids that match these are ALWAYS warped and rarely fit correctly so be ready to dispose of a few. We appreciate your review! We do not recommend using this product with any food that exceeds 105 degrees. If you are looking for a different product to better suit your needs, please contact our Customer Solutions team. 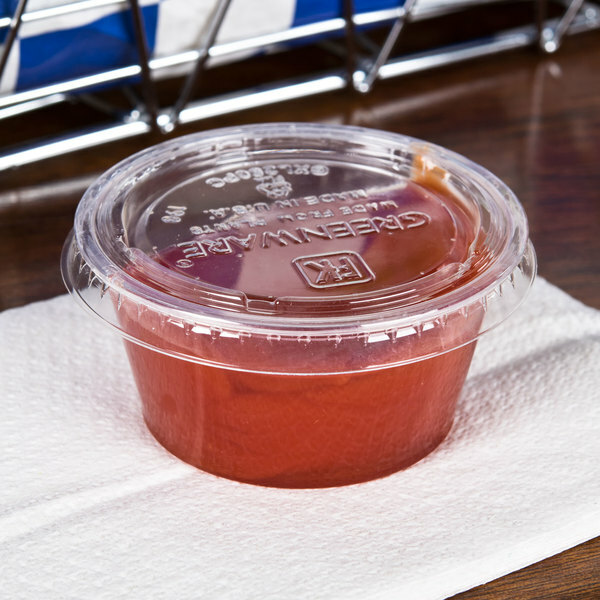 These portion cups are a great way to be able to keep things like salsa individually portioned and ready to go. It saves on portion control! These fabri-kal greenware portion cups are a great eco-friendly option for any restaurant. These cups are available in various size and with matching lids. Perfect for dressings, dips or condiments. No complaints here. We use it for when customers ask for sides of sauce or something similar. Holds up well and doesn't crack easily! Good stuff! Love the idea of Greenware, and it's a solid cup, but these really don't hold thin liquids in that well. Not to mention you really cannot put anything warm in here--so follow their temp guidelines! These 2oz cups are just what I needed to provide my customers with the exact amount of sauces and jams for dipping. I will be stocking up on these little babies soon. Great job, guys! Sturdy and good quality plastic material. 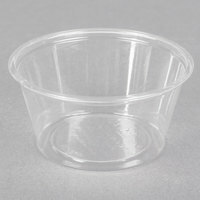 We use these small cups for cake and granola samples and at catering events for individual portions. They work well with or without lids. These compostable cups are our go-to "zero-waste" honey tasting option! They store well, so we can get 2000 at a time and put them away no problem. It is a little difficult to snap on some of the lids..